HOW MUCH THIOGUARD® DO I NEED? On the surface, it’s easy to do the theoretical calculations and provide exact alkaline equivalents. However, field and trial experience tells us something different. The amount of high grade Thioguard® – magnesium hydroxide required to achieve equivalent buffering/performance benefits in the biological reactors tends to be much lower than the calculations would suggest. Why? Often overlooked are some of the side impacts of lime use, such as softening and pH spikes, and confusion about what standard total alkalinity tests are telling us. An easy way to find out the extent of softening that is taking place in your facility, is to filter your sample with a 0.45 micron filter before titration. This will remove the insoluble CaCO3 particles that are not “biologically available.” Another significant, yet overlooked impact is the EPA documented sludge production typically associated with lime. 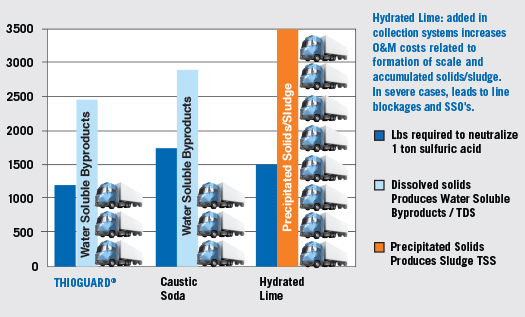 Lime is commonly used in potable water to “soften,” or remove hardness minerals, such as calcium and magnesium from drinking water, in an effort to minimize the effects of potential scaling in the water distribution system. However, in the softening process, calcium and magnesium are removed from water in the form of calcium carbonate (CaCO3) and magnesium carbonate (MgCO3) which are also forms of alkalinity. Removing hardness from water also removes alkalinity. In wastewater, lime is often considered as an alkalinity supplement. However, the effects of lime softening can have undesirable consequences to the biological system, e.g., removal of alkalinity, creation of CaCO3 sludge, and the potential for bio-upsetting pH spikes. The simple fact: Thioguard® and lime slurry have different physical and chemical properties that affect how each responds to and reacts with the systems to which they are added. And because of these differences in properties, the impacts they impart and the utility for their use are starkly different. Lime produces calcium carbonate in wastewater which acts as a coagulant for hardness and particulate matter. Lime is an effective phosphate removal agent, but results in a large sludge volume and the addition of treatment chemicals, especially lime, may increase the volume of waste sludge up to 50 percent. related to formation of scale and accumulated solids/sludge. The use of lime generates significant amounts of sludge in wastewater collection systems and treatment plants. On a chemical basis, one ton of lime can generate as much as 5 tons of 20% sludge cake to remove or dispose. In contrast, Thioguard® reactions in wastewater produce only water and water-soluble products as TDS with NO added sludge. In fact, customers using Thioguard® have reported reductions of 15%-25% in total solids/sludge produced, due to a combination of improved biological performance, divalent cation bridging of floc matrix, and reduced inorganic solids loading. Most wastewater treatment plant operators understand that their wastewater treatment plants function best at some ideal pH and that a minimum amount of alkalinity is required to keep microorganisms happy. But too often, the values of pH and alkalinity are incorrectly used interchangeably, and a thorough understanding of each parameter’s true relationship to biological stability and optimal performance – gets lost in the translation. Most often this error in terminology stems from the use of the most common alkaline pH modifiers and alkalinity supplements, caustic soda and lime, where their use may successfully meet pH demands, but will likely fall short in supplying adequate alkalinity requirements without adversely elevating pH beyond biologically healthy limits. And often, maintaining pH stability and uniformity across entire treatment basins remains a virtual impossibility. 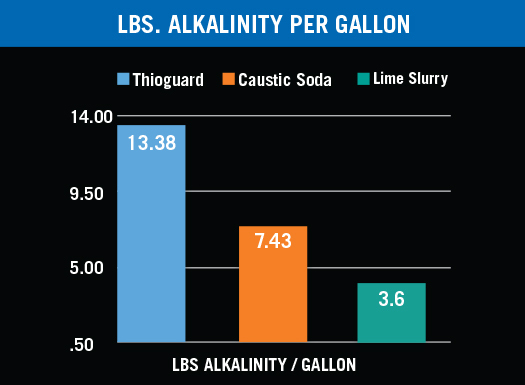 Compared to caustic soda or lime, Thioguard® is capable of supplying significantly more alkalinity in a bio-available form to a microbial wastewater system without adversely affecting pH. This creates a more suitable environment for bioremediation of BOD and nutrients like nitrogen and phosphorus. 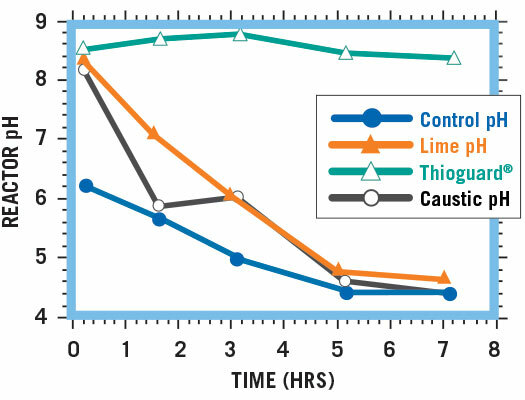 Moreover, because magnesium supplies a light-weight, divalent cation, unlike the monovalent sodium in caustic, and heavier calcium in lime, Thioguard® helps to generate a denser, more easily dewatered sludge, with a higher percentage of cake solids. It takes 100+ mg/L of Thioguard® to raise a water sample to pH 8.8. This same 100 mg/L of Thioguard® has the same neutralizing power as 138 mg/L of caustic soda and 135 mg/L of lime and would be the equivalent of, though significantly more reactive than, adding 172 mg/ L calcium carbonate alkalinity on a CaCO3 basis, assuming 100% bicarbonate conversion. Reactor systems treated to an initial pH of 8.5 using Thioguard, caustic soda and lime.Equivalent amounts of acid added to each over time. THIOGUARD® can help your plant!